Looking for a quick pick-me-up before or after a workout? 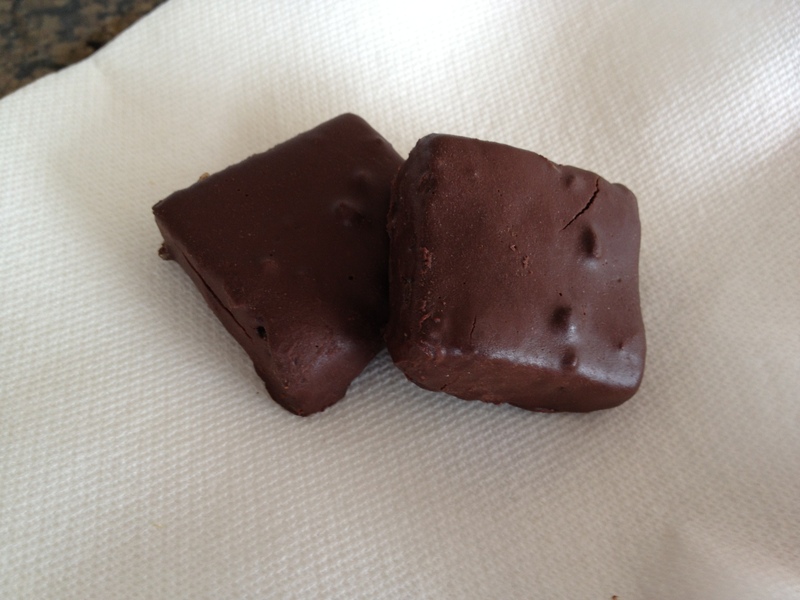 Try these delicious home made protein bars. They taste so good that our kids think they are candy bars. If you store these in the freezer, they’re a great ice cream bar substitute. Place dates and prunes in hot water and let sit for 10 minutes. Combine flax seed and water and let sit. Add prunes, dates and hot water to food processor and blend until pureed. Add all other ingredients and process until ball starts to form. Scrape sides of bowl throughout process. Transfer mixture to 9 x 9 baking pan and press into bottom. Store in freezer for 30 minutes and then cut into squares. Combine ingredients for coating into a bowl and microwave in 1 minute increments until melted. Mix after each minute. Dip squares into coating mixture and place on parchment paper. Let dry for 10 minutes and then place back into the freezer until ready to eat.